-Confirmed by J.J. Abrams at the Paramount CinemaCon presentation on April 25, 2018 that the film is, in fact, not an entry in the Cloverfield franchise, despite initial speculations. -The movie featured more practical effects rather than the standard CGI effects most movies use. This was done to get a better reaction from the actors involved in the scenes where something gruesome would happen. 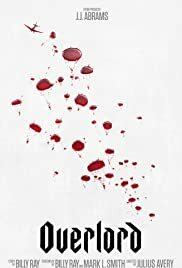 -The title of the film is no doubt in reference to Operation Overlord, the code name for the Allied operation for the Battle of Normandy, launched the successful invasion of Nazi-occupied Europe. This, alongside Operation Neptune would become known as D-Day. -The first movie from Bad Robot to be rated R by the MPAA. -The movie makes reference to Chloe's last name once in the film (Laurent). This is possibly a nod to French actress Melanie Laurent who played Shosanna Dreyfus/Emmanuelle Mimieux in the movie Inglourious Basterds (2009). I got to see this recently and well it was intense to say the least. It was rumored to be an installment in the 'Cloverfield' franchise, but is not. It is about some Allied soldiers on D-day stumbling onto a Nazi lab where they were creating 'super-soldiers' (zombie soldiers). It has the feel of of a good War movie with the added scifi stuff (with the zombies)... but not so unbelievable as to how far the Nazi may have been willing to go. I thought the movie was done well, even down to the atmosphere we are taken into. The horror was not that horrific, but the intensity was there. And the 4th installment in the 'Cloverfield' franchise is still 'officially unannounced' ... but seems it is in the works. This could also be a take-off from the Capt America Movie...!